President Donald Trump’s administration is putting together a privatization-centric plan that reportedly would provide $200 billion for infrastructure repairs. Chances are that won’t do much—not when estimates suggest we need $4.6 trillion to improve things. That’s too bad, because the roadways are now hitting us over the head to try to call attention to the issue. 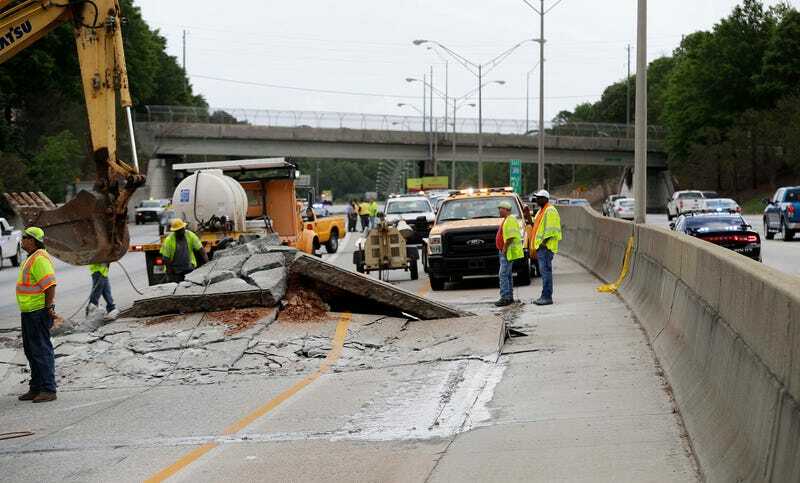 This week in Michigan, a woman was knocked unconscious by a piece of concrete that flew up from the road and hit her in the head while driving along I-696 just north of Detroit, according to WXYZ in Detroit. ClickonDetroit.com reports the woman was driving a Buick Enclave around 8:30 a.m. Wednesday, when she was hit in the side of the face by the concrete, and struck a Pontiac Grand Prix. The news site says the concrete—a chunk that reportedly weighted about 10-12 pounds—broke her sunglasses and sliced her forehead. She received treatment at a nearby hospital with non-life threatening injuries.